There's been some solid progress this month. The first phase of early playtesting began with a couple of selected players, and I'm already making changes to some of the Gamma fights. This section has been a little harder to develop and test than other areas. I usually do a lot of playtesting myself, and write down any details I find to check them later. The thing is, since the atmosphere is so dark and claustrophobic, I can't help but feel uncomfortable and constantly tense. Yes, I did the level design myself and I still feel uncertain about what the darkness hides, and that made testing a lot more stressing. The third miniboss is also being heavily tweaked, it showed to be as frustrating and unnecesarily hard as the first versions of Arachnus. This one will be a little bit easier, since the fight is mandatory to proceed to the rest of the area. We're in July, and that means it's time for the annual Metroid Marathon, a celebration that the awesome guys at Metroid Hearquarters organize every year. They contribute to Child's Play this year too, so make sure you attend to the event, there's some impressive skills on display, and many surprises. You can follow the event at their Facebook page, and at their official site. And last but not least, AM2R was reviewed by an awesome youtube producer called DookieShed. Here's the video, but you should really check out the rest of his channel. His Megaman videos made me want to play X again. "The thing is, since the atmosphere is so dark and claustrophobic, I can't help but feel uncomfortable and constantly tense. Yes, I did the level design myself and I still feel uncertain about what the darkness hides (...)"
Genial!!!! me parece increible todo lo que has logrado, sigue así! So delightful! The lighting definitely adds a wonderful touch to the game. It's great to hear that you're focusing on the atmosphere. If it's unnerving even you, it must be very effective. I just hope you can keep a balanced progression so that the farther into the game you go the more tense it gets (If you're doing this much this early in the game, I imagine it might be hard to top it in later areas). I can only imagine how awesome the Queen's Lair could be if you can make it even scarier than the rest of the game. I'm willing to wait as long as it takes for you to get everything perfect. I've been working on my own project for over three years, so I understand the need to get everything right. Best of luck to you. I have been watching your project for some time now. I applaude your talent, and I can't wait to play this beautiful pearl you have been polishing for a long time. Awsome Progress doc. Can't wait till next demo!!!! Este juego es una bomba, Genial con la reseña que te dieron, haría algo mejor que la reseña, si Nintendo te ofrece poner tu juego en la eShop para 3DS, sería algo megafantasticamente chido jugarlo, me explotarían los huevos por jugarlo cuando lo estrenes. Me gustaría seguir tus pasos para ser un creador de juegos como tu. piensan portarlo algún otro sistema?? Dude I seriously cannot wait for this to come out. It is freaking impressing. The dark feel you're adding to it? YES. 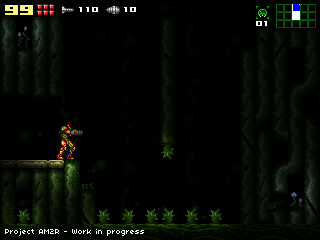 I always thought that Metroid is a perfect game to have a creepy dark atmosphere to it. It's shown in a lot of the Metroid's. Dude, keep this up. This will be amazing when it's finished. You can expect a download from me. I do have a question by the way.. Once Another Metroid 2 Remake gets close to completion do you consider in using a more inspired title for your game? It is understandable that a similar fangame called Metroid Sr388 came around before, but perhaps you and your team could come up with your own ideal finish title! Oh god. This only makes me wanna play MORE! I loved the demo as of yet. I am super excited for the completion of this game. Cant wait Doc. I really like the idea of the dark, creepy area you're working on, but one thing has stood out in the concept shots... Samus' sprite is still quite bright, to the point where it looks a bit out of place in the moody area. Super Metroid did a really good job (perhaps even without any color tweaking between areas?) helping her sprite blend in to all the different game areas. Is this the sort of palette/shading tweak that can be made in AM2R, to help root Samus into the world she is exploring? Hopefully without making her hard to keep track of on-screen, of course. Keep up the good work, this will be the best remake ever. Is it perhaps possible that you add recoil to samus when she shoots? 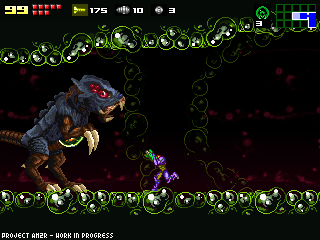 Like in Metroid Fusion. Whenever she shoots there is a little recoil. I think that it would look better, than Samus shooting a missile and remaining in a solid state. Thats just a little suggestion from me. Anyways, the game will be great! Hay tantas cosas que sin duda no me esperaba ver en los avances que se han hecho (estuve unos meses desconectado del internet y por eso no pude seguir el proyecto de cerca). Magnífico, sin duda magnífico, el destello que dejan los misiles al lanzarse ahora está genial, pero recuerdo haberlo dicho en otra ocasión... cuando sacaron el primer demo del AM2R el sonido cuando se tomaba un misil no eral de misión zero sino el de Metroid 2, una creación magnífica que habías creado y le daba el toque de semejanza al proyecto, pero luego de que salieron los otros demos avanzados se fue perdiendo eso, y el sonido ahora es el mismo que tiene misión zero al tomar misiles. Cómo recomendación creo que el sonido iniciar estaba excelente y propio de un Metroid 2 y deberías retornarlo, detalles como esos hacen que el jugador se familiarice con este nuevo proyecto. Ojala se tome en cuenta mi opinión (al menos con una respuesta). hey there... I would love to help with the play testing as I had experience with game testing in the past and I am REEEAAAAALLYYY looking forwards this game being completed, I havent been this excited about a game coming soon since Metroid Prime Trilogy, I love how the game looks and handles from the demo version, also take your time with the testing, thanks again for making this remake that this game deserves. el creador del vidiojuego abla español me pregunto???? so... in the demo... can find the Hi Jump Boots? or do I have to do the Ice Beam trick? I guess I haven't played a demo since Confrontation v2.5 because that was the latest build I had. I just played the latest demo build and was surprised at how much has drastically changed. The game was progress it? When upload the next demo? you participate in NCFC this year? I usually thought the scariest part of the original Met2 was the last Chambers (the part with the Omegas a ways off before you attack the Queen), when it felt more like survival horror than your typical Metroid game. Still, nice to hear good progress. Keep up the good work. Oh well, I wish we got updates a little more often. I want to know % completion. but not necessary, Can't wait (but alas I must) for the finished product. I know technically you are not allowed to make any profit of this, but is there any way to donate? I would really love to Show my and our appreciation of your work! The Gamma Metroids are creepy looking. It makes me wonder what you have in store for the Zetas and Omegas, not to mention the Queen. You're doing fantastic work.